I have no idea why Google Docs did not have visual pages in the document editor. It made things so hard to keep track of when you were printing out a document. Maybe they just wanted to be different from others? But now they accepted reality and added the feature. Now you can see how many pages you have actually covered in the document. 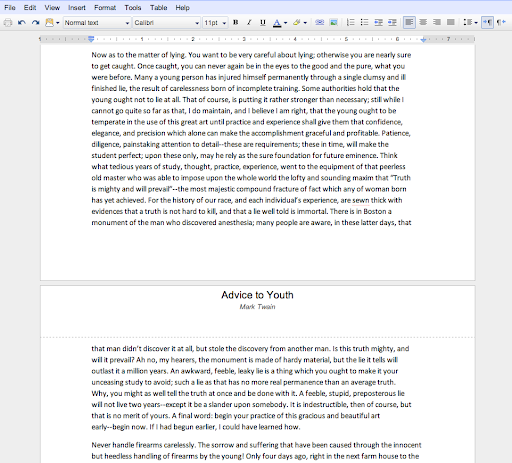 You can also see the pages splitting as you scroll through the document, just like in other word processors like Microsoft Office Word and Apple iWork Pages. The footnotes now appear at the bottom of pages instead of the little pop-up(?) things in the margin, which might be confusing to so many users. The new update should roll out to everyone very soon. If you still prefer the old, continuous layout for the pages in Docs, you can select the 'Compact' document view from the 'View' menu.